They had just the right amount of powdery cheese coating and were an awesome shape, perfect for whipping at kids in the cafeteria when teachers weren't looking. They vanished, returned briefly in a similar form as Planters Cheez Mania, and were seen in that form as recently as 2008 or 2009, mostly in Blockbuster video stores. Now, however, even those seem to be gone. A moment of silence, please, for this divine and dead snack food. Even if Planters has discontinued them, there are other snack makers still producing ball-shaped cheese puffs. We buy them once in a while at our local BJ's and they come in a huge clear plastic container about the size of a water cooler jug. I think the brand we buy is Utz, but don't quote me on that. Aw, man! Those were great! How could they have disappeared? I am pregnant with my first child and DYING for Cheez Balls. I bought some Target brand ones (crap), and the Cheeto's Asteroids (awesome but pricey!). How I wish the blue Planters can would reappear in the grocery store!! (Mmm, maybe with some Tato Skins). 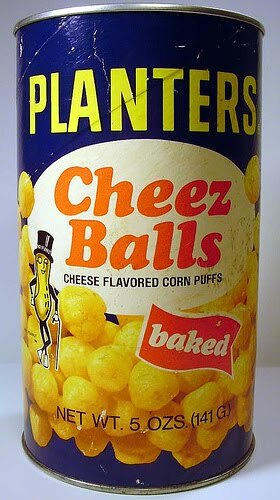 I remember them the perfect snack no other cheese ball out there can compare to planters, not utz, target brand, or frito layno one can planters was and always will be the best I wish it would come back.